The 2017 Leader of the Year award was presented, as is the tradition, at Leadership Day at LiU. 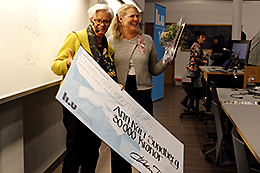 The recipient is Ann-Kari Sundberg, head of department at LiU’s Department of Culture and Communication. According to the jury’s citation, her leadership has inspired renewed confidence in the future amongst her departmental colleagues. “It’s a huge honour – and a real surprise as well. I didn’t see this coming at all that,” says Ann-Kari Sundberg, holding a big bouquet of flowers as she receives congratulatory hugs from her colleagues. Ann-Kari Sundberg is senior lecturer in French, and has been programme coordinator. For the past three years she has been head of department, and will continue in this role next year. According to Vice-Chancellor Helen Dannetun, the choice shows it’s possible to win the award in the face of adversity. As the award came as such a surprise, Ann-Kari hasn’t had time to think about what she will do with the SEK 30,000 in prize money. “This year’s Leader of the Year receives the award because, in a department facing considerable challenges, with demands for change, she has exercised her management role in accordance with the university’s fundamental values, and with clarity, perseverance and dynamism. She has been described as positive, supportive and courageous, and with her leadership she has inspired renewed confidence in the future amongst her departmental colleagues.